Beginners typically start out on a basic, dreadnaught style acoustic guitar. Here we have five common options for beginners. When weighing which one to choose, always consider your overall goal- are you looking for a hobby, or to form a band, or just to screw around at home to pass the time and challenge yourself? One instrument here stands out from the rest based on its versatility to appeal to beginner players in all of these categories – the Jasmine S35 acoustic guitar, natural. But depending on where you fall on the spectrums of learning and motivation, here is a breakdown of the options. When considering getting into playing guitar, keep in mind that a little extra investment up front can save you a lot in the long run. Often, the cheapest guitars are going to require more maintenance and cause more frustration. It is typically worth shelling out that extra fifty or seventy bucks to buy a slightly nicer instrument, and it is always worth it to buy a case, tuner, and extra pack of strings. If you have never before picked up a guitar, 38” Black Acoustic Guitar can serve its purpose for you. The guitar is light weight and easy to strum, but overall is of poor quality. It will work for you while you learn basic chord progressions and get accustomed to the feel of playing and of moving your hands up and down the neck. I would not, however, recommend taking it out of the house because this guitar is easily damaged. On the plus side, it does come with a strap and picks and at a Currently Not Available*, you aren’t taking much of a risk by buying this product. I would recommend buying this over buying a super cheap used instrument simply because you never know what a used guitar has been through or why it is being sold. Still, don’t plan on this instrument lasting more than one year. If you are serious about learning to play, take your equipment seriously as well. While you learn on 38” Black Acoustic Guitar, try to make notes of the things that you like and don’t like about it so that when you upgrade to a better instrument you will have an idea of what you are looking for. This guitar is definitely great for figuring out what you don’t like in an instrument. It also makes for a good gift to a child or significant other that has been talking about wanting to learn guitar but hasn’t taken any steps toward the goal themselves. You will want to change out the strings shortly after purchase because the stock strings are cheap and don’t play very well. This guitar will not be suitable for anyone other than beginners, so weigh this in your decision making- am I buying a guitar because I really want to play and become good? 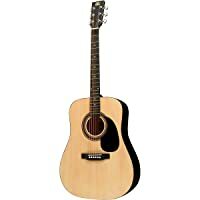 Or am I buying a guitar because I want to be cool and show off simple songs to my friends? If you chose the former, than consider buying the Jasmine S35. If you chose the former, than this guitar bundle may be the one for you. The build is strong and durable- this instrument can be taken on road trips and handle a few bumps and bruises without affecting the playability. You may need to change the strings because again, the stock strings are of poor quality and don’t hold a tune. Before you string up with a nicer set, adjust the truss rod to your liking. This will likely be the only maintenance you will need to do on this product- it holds a tune well on its own and with the solid wooden frame this guitar is a banger for the cheap price. When it comes to learning, the Jasmine S35 is the perfect instrument. Its standard size and dreadnaught shape will get the learner comfortable not only on this specific guitar but most acoustics they will come across over a lifetime of playing. The tuners and neck are of a decent quality. When picking, a beginner won’t cause extra strain on their fingers and will easily become comfortable with working the neck and strumming. The saddle comes a little high but can easily be adjusted by watching a YouTube video. You will find this instrument very good for learning to finger pick. Also, it is easy on the leg while playing- something that certainly cannot be said about every guitar out there. There is not a better beginner guitar on the market right now than the Jasmine S35. This is an instrument that you will be proud to play on and that will hold its own both in lessons and as you move into light gigging. Even years after purchase, this instrument will call you to play it and will satisfy your musical urge. You won’t need to change the strings any more often than on other beginner-centric acoustic guitars. It does not come with a case so if you plan to take it out of the house (which you will as soon as you have learned a couple songs to show off), get a gig bag or case for it. Something to keep in mind here- because of the high quality of this guitar, the fact that it does not come in a bundle should not hinder you from purchasing it. You can easily buy a strap, tuner, gig bag, and picks separately and not spend much more than you would with a bundle. That way you have everything you need plus a guitar that you will be able to play for years to come. 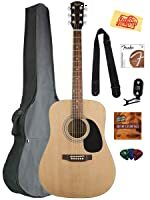 I won’t beat around the bush here- Fender Squier Acoustic Guitar bundle is perfect for beginners looking for one-stop shopping. It literally comes with everything you will need to become a guitarist and saves you the trouble of having to shop around and ask a bunch of questions at the store. The Squier guitar is your average starter instrument. Squier guitars are basically the cheaper, poorer quality version of Fender so while you are getting the name you are not getting all of the quality. In terms of maintenance, though, Squiers are pretty easy going and even if you do need to make minor adjustments a guitar tech at any store can do them for you in just a few minutes. Overall, I would place this bundle above most other starter packs. 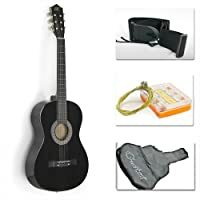 Certainly above 38” black acoustic guitar starter pack, because the guitar is much better. If you actually want to learn to play and make it a sustainable hobby in your life, the extra up front cost is worth it. The biggest plus of this bundle is the instructional DVD- you can save yourself some money on lessons by starting with this DVD and mastering everything that it teaches before dropping any additional money on learning. Solid framework on the dreadnaught style body, with action that does not necessarily require immediate adjusting. The tone is very deep and impactful. Of all beginner acoustics this one sounds the best. Yamaha FG700S Solid Top Acoustic Guitar holds a tune very well and is a sturdy beast. Just about everything here is standard- the size, the fret count, the playability. If one word described the Yamaha FG700S it would ‘consistency.’ This guitar will last a beginner for years as they progress from just learning into lessons, gigging, and beyond. If you are a traveler, this guitar is a great buy for you- just make sure you have a gig bag or case (that should go without saying for any guitar). The instrument sits well on your leg and is also easy enough to play with a strap around your neck, which is nice if you plan on getting out of the bedroom. The Yamaha FG700S looks as good as it sounds- the untrained eye will not immediately identify this as a beginner instrument. What a beginner will notice is that the neck is easy on their hands as they train and get comfortable. It never fretted out on me with the standard action setting. Additionally, when learning songs online I noticed that the guitar sounds very similar to the tone of the instruments in many of the songs. I am sure Yamaha did this on purpose and perhaps this accounts for some of the reason why this guitar is more expensive than others designated for beginners. If you are looking to impress someone with a gift and don’t mind spending a little extra, you have a winner here with this guitar. Value- that’s what you are getting with the rogue. The Rogue RA-090 can handle all of these things. It is run of the mill- the dreadnaught body, tan finish, and light weight are exactly what you picture when you think of an acoustic guitar. The tone is average- not the Jasmine S35 or Yamaha FG700 but better than the standard black acoustic from the bundle described above. The action is moderate and easy enough to work with for new players. Musician’s Friend, the maker of the guitar, is a trusted brand and are known for dependability. On the negative side- this guitar just feels cheaply made. It took a while to gain confidence in the build. The string tuners are not the best and it does not hold a tune as well as some other guitars in the same category. Because of the cheap build this guitar shows dirt and dust easily. Keep a rag in the case with the instrument so you can wipe it down frequently, if this is the guitar you end up buying. This instrument is the definition of ‘what you see is what you get.’ It looks light and cheap because that is what it is. It offers a good bargain, which must be why it continues to sell. For those looking to learn at a slow pace and not be too serious about gigging or impressing anyone, this guitar serves its purpose well enough. Because of its cheap price tag, it is hard to feel let down by the Rogue RA-090 no matter what happens. When it comes to price, your best deals are the 38” black acoustic bundle and the Rogue RA-090. Both of these in turn have a price point Currently Not Available* and Currently Not Available*, making them the most affordable. In terms of overall value, the Fender Squier bundle is the best overall deal- you are getting a medium quality beginner guitar plus all of the extras for Currently Not Available*. The Jasmine and Yamaha guitars are higher priced, knocking them out of consideration if value is priority one. Quality wise, the Jasmine S35 and the Yamaha FG700S knock the other three out of the park. Both the 38” black and the Rogue are the cheapest quality guitars, built for mass production and sale to total beginners with no frame of reference. In The Fender Squier is a decent beginner instrument but not nearly as durable as the Jasmine and Yamaha and lacking the tone of both of them. Image wise, The Jasmine also wins- it is the smoothest looking beginner guitar on the market. The 38” black acoustic looks cheap and unprofessional. The Squier looks like a Fender, but as soon as anyone reads the label it is easy to tell it is an impression. The Rogue and Yamaha are smooth looking but off the cusp do not have the same curb appeal as the Jasmine. Each of these five products has its pros and cons. For what you get, the bundles are the best price bargain, but neither of the bundles contain the strongest instruments. With the 38” Black Acoustic starter package please keep in mind the quality you are sacrificing. If you really want a package, I highly recommend going with the Fender Squier bundle because of the higher quality guitar and the fact that it comes with the instructional DVD. The Rogue RA-090 should be tossed out because it is poorer quality than the Jasmine S35. If you really want playing guitar to become a part of your life a better instrument will help out a lot in the long run. When it comes down to it, the best selections here are the Jasmine S35 and the Yamaha FG700S. Between the two, the Jasmine has a much better tone, holds a tune better, and is a more durable instrument, making it a better buy for the money. The Jasmine S35 is the best option here for overall playability and quality. You will look cool, learn well, and be able to play the same instrument for years to come.